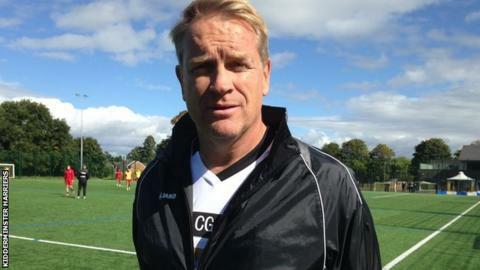 Kidderminster Harriers director Colin Gordon is to remain in caretaker charge of the National League's bottom club while they search for a new head coach. Gordon has so far overseen two matches, a 3-2 away defeat at Bromley and last Saturday's 1-1 draw at Barrow. And he will still be in charge for Saturday's home game with fellow strugglers Welling United. "We hope to have someone in place in the next couple of weeks," said chairman Rod Brown. "Supporters should be in no doubt that the football world still sees Kidderminster Harriers as an attractive proposition. That's been reflected in what we've seen as a board in this process so far. Harriers have suffered their worst-ever start to a season, having so failed to win in their first 13 National League matches. They have drawn six of those games, leaving them only four points adrift of safety. Kiddy failed to win any of the first 10 games under Steve Burr three seasons ago - and ended up missing out on automatic promotion by just two points. "But the process will take as long as it takes. It is vitally important for the long-term future of the club that we get this right and, in that sense, we are in no hurry. We are happy that the team is in good hands in the immediate short-term as Colin Gordon and the staff have been working hard and the players have responded." Harriers, who have slashed their playing budget over the last six months, started the new season with Gary Whild as manager. He was then moved sideways to become 'head of football operations' when the club offered the job of head coach to former England goalkeeper Tim Flowers. But Flowers never accepted the job, meaning that the Harriers then undertook their next three games without anyone formally in charge. Flowers then left following Harriers' last home game, the 2-0 defeat by Lincoln City, since when Gordon has picked the team. Much-travelled former Harriers striker turned football agent Gordon, 52, joined the board at Aggborough in April.